Zimbabwe is in a mess, but I think all Rastafarians cannot let that stop them from even a few minutes to reflect on the meaning of this day. 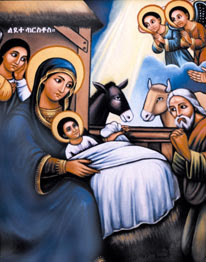 We join Rastafarians around the world, and Orthodox Christians in celebrating the Feast of the Three Kings, also known to English-speakers as "Ethiopian Christmas". Last year, I had the chance to explain in a local paper to Zimbabweans why we Rastafarians regard this day as sacred, and why we reject the Christmas Day of most other people. So, I am not going to do that again. I am going to call on all Rastafarians to reflect on the meaning of this day; a celebration of the birth of our Lord and Saviour Iyesus Krestos, the forerunner of His Imperial Majesty Emperor Haile Selassie I. On this day, the three Kings did find the Infant Christ and His Mother, and paid homage to Him, bringing Him the same gifts that our Father Adam was first given as his first worldly goods. How I long for there to be a conducive environment in Zimbabwe for Rastafarian people to continue in the direction we had begun to chart around 1998 when the congregation of the Holy Sanctuary/Senaah/Ophir was revived. We would have plenty to celebrate then, and there would be plenty food, and freedom and security. I forsee those days returning imminently. All Rastafarians, in Zimbabwe and elsewhere, this is a day of joy still- a joy that becomes more profound as the meaning becomes clearer. I pray that we will have more joy, and that our hearts and minds will be opened up to an even greater understanding. Yihun inji, amen. As with previous occasions, I offered the fervent prayer that the next Genna, I will celebrate with a life-partner that will share its meaning.